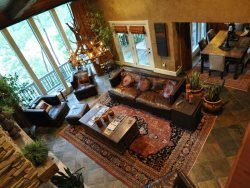 Spectacular Mediterranean 7 bedroom, 7 full baths, 1 half bath estate on Lake Hamilton. Every room has a view of the lake! Professionally decorated and appointed with a stunning original art collection. The sweeping open floor plan that maximizes the 300-degree view of the lake, w/ great expanses of windows filled w/ breathtaking views, incredible custom artwork throughout the home, including paintings, sculptures, and a 17 ft custom blown glass chandelier. High ceilings & grand spiral staircase greet you at the front door, with an elevator, and 3 gas fireplaces. Chef's dream kitchen with granite counters & bar, custom cabinetry & professional grade appliances is the perfect place to gather.With two Wolf ovens a six (6) burner wolf stove, flat top grill/griddle, and char-broiler, built in Sub Zero refrigerator/freezer, and dual Bosch Dishwashers, entertaining and vacationing with a large group or multiple families will be a breeze! Spa-like master retreat w/ amenities galore; sip your coffee in bed while enjoying a view of the pool and lake! Walk-in closets, huge walk-in shower, watch one of two TV's while soaking in the jetted tub! Spacious bedrooms, separate "guest/mother in laws quarters" and large bunk room. Currently sleeps 24 in beds, wireless internet, 50" smart TV's in every bedroom (master has a 65" and a 55" in master bath). In-ground infinity pool over-looking Lake Hamilton. Double stall boat dock. Step onto this one of a kind patio and fish straight into the lake. Laundry room with two sets of washers and dryers, plus a third full sized washer & dryer in the master bathroom. Ping pong area with TV and sectional sofa. Everything you need for your dream vacation in this one of a kind "luxury meets fun home"! Built in SUB ZERO refrigerator & freezer. Matt was excellent to work with and was very accommodating. This home was very comfortable and its location was over the top ! Great, once the mix up was discovered, Mr. Matt was very accommodating from beginning to end. We are just looking forward to coming back to the Marlin Houzz during the summer so that we can fully enjoy every aspect of the home, so don't forget to touch base with me Mr. Matt when you get a chance. Thanks again for your awesome customer services and generosity. Totally awesome at all (4) properties! Great family vacation! Everyone loved it! Very accommodating from the get go. No problems whatsoever. The home is very well laid out. Very stately and assuring. The view of the lake is awesome. The home was able to handle our entire family with ease. Beautiful Lake Property. First of all Matt and his team are fantastic. We have a physically disabled member of our family who has a specialized wheelchair that is very large. Matt actually reconstructed a shower so it would work for our son-in-law. Matt also promised and totally delivered on several other projects. It is great to deal with someone who does what he says he will do. And his team is great too. Really nice people. Loved The Marlin Houzz! Enough bedrooms AND bathrooms for our large family, and plenty of privacy. The kitchen- great room was our gathering place. You will not find a more beautiful and beautifully equipped kitchen! And the pool! The kids lived in this fantastic pool looking at our great view of the lake. Matt just put in a totally new deck. Beautiful and completely top notch! A great great property. If there was one thing I could add that this wonderful house could use is more towel racks. Loved our stay! We had a fabulous family gathering. The property was perfect for us! Many thanks to your team! After arriving, we had a couple of questions about Roku and Apple TV, as well as one appliance. A Blue Sky staff member personally came to the house to resolve our issues. Excellent customer service! Beautiful home, gorgeous setting, easy access to everything we wanted to do! We never drove more than about 15 minutes to get to our desired locations. This home was perfect for our family! Lots of space for our entire family to cook, eat, and play together! The property was gorgeous! I will highly recommend your properties to my family and friends. Thank you for an awesome stay! Great team to work with! Very nice and always able to help or answer any question you have. Home is amazing! Beautiful place. We would recommend this home for any age! From the pool to the fishing off the dock kids loved it! Kitchen was equipped with everything we needed. Kiddo's loved the room with the 4 bunk beds, they were able to enjoy each other the whole trip! Matt is an awesome person to deal with, this is the second home we have rented from him and both were wonderful fun homes. We were able to boat to restraunts. Highly recommend this home! We will be back! Matt and his crew are the best! I have never had better response dealing with any vacation rental. Blue Sky gets what their guests want in vacation homes - luxury and pampering definitely their forte. I have rented many vacation rentals - but this is absolutely my best experience ever!! Thanks Matt and everyone at Blue Sky - we had a wonderful time. It was awesome to hear from my very picky family - "this is the best! Can you get us something this wonderful everytime??" You can be assured I will be calling Blue Sky again! Thanks so much for the wonderful service and attention to detail!! !